My mom doesn’t remember the bracelet I gave her once. I had gone on a field trip to the aquarium and used my souvenir money to buy her a bracelet made from sea shells. I’m sure it looked stunning on her! She does remember the time my brother gave her a pin with a raccoon on it. My dad couldn’t believe it when she wore it to church. It’s a mom thing. Yesterday morning, my husband and my son, Fritz, were the first (after me) out of bed. They gave me the usual good morning hugs and kisses. Bill picked up the paper, and Fritz turned on Disney. The TV reminded viewers that it was Mother’s Day, so my two men dutifully wished me a happy mother’s day. Several minutes passed and down came Katie. She immediately came up to me, gave me a big hug, and wished me a happy mother’s day. Bill was astonished that she could think of that first thing in the morning. “She’s a girl,” I said. Yes, I knew there was a good reason to have daughters. Katie had a present for me, too. 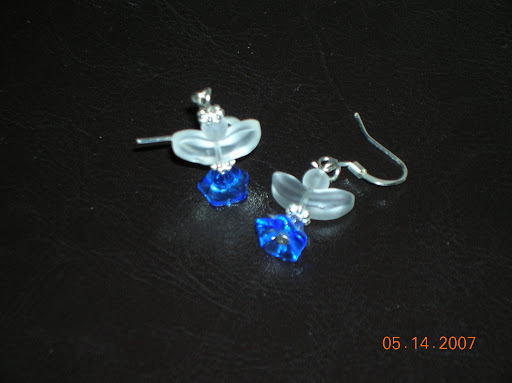 Dangly angel earrings she had made herself at a friend’s house under the tutelage of the friend’s older sister. In blue – my favorite color. Aren’t they lovely? Of course, she asked if I would be wearing them to church, and of course I did. It’s a mom thing. On a related note, my sister sent me this e-card. I laughed so hard, I cried. And it kept the kids amused for at least 15 minutes or so – long enough for me to slip away for a short nap. This entry was posted in home life, katie. Bookmark the permalink. The earrings are so sweet. And that card….I had tears coming out of my eyes, I was laughing so hard. I think I’ll have to send the link to my sister! Thanks for the smiles and the laughs that your blog post gave me. Happy Mother’s Day! What sweet earrings. Loved the ecard too. Happy Mother’s Day! Oh. My. Goodness. Hahaha. Seriously, the makers of that card must have videotaped my house. And I only have one lovely, darling, small human being that I am able to so clearly misinterpret his comments… The earrings are lovely. None for me, although AnonymousDad did manage to hide a card in the house (under my cookbook! Ha!) before he left for Texas a week ago.